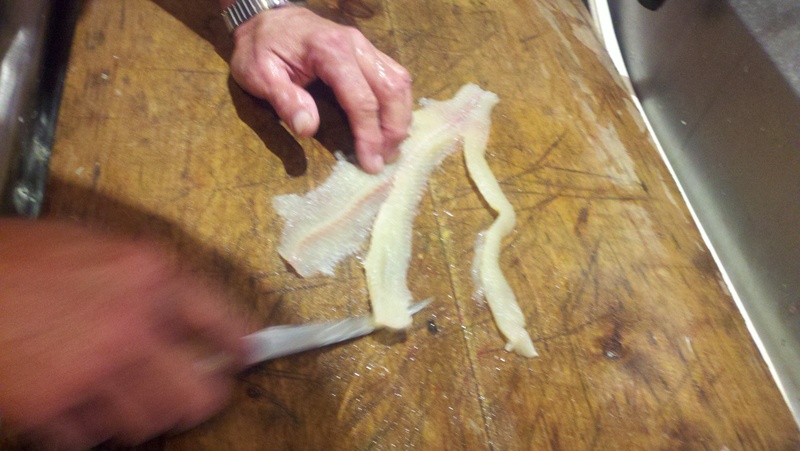 05.30.13 A true fish story (with pictures)! 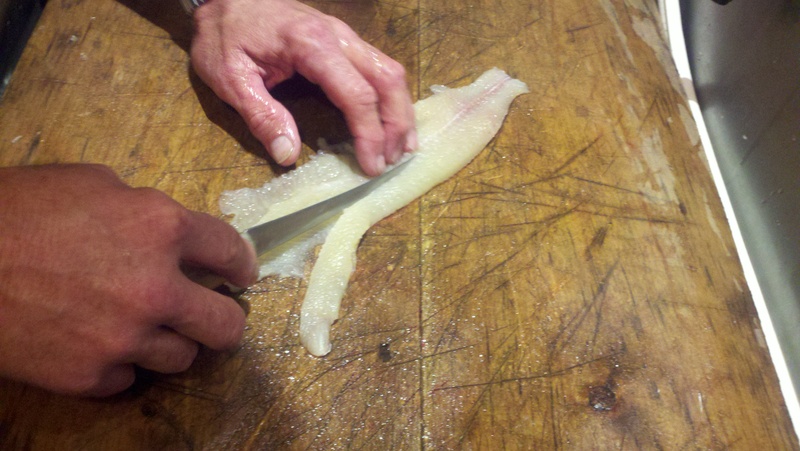 We’ve heard much about the Northern Pike being really slimy and hard to clean. Then some people started telling us how delicious they could be once you’ve done the cleaning. This evening, after baking the cake that didn’t come out so great looking but really did taste fine, I decided to go back to the lake to see how Roy’s evening was going since he was still working. Have I mentioned it is so cool living right next to a lake! 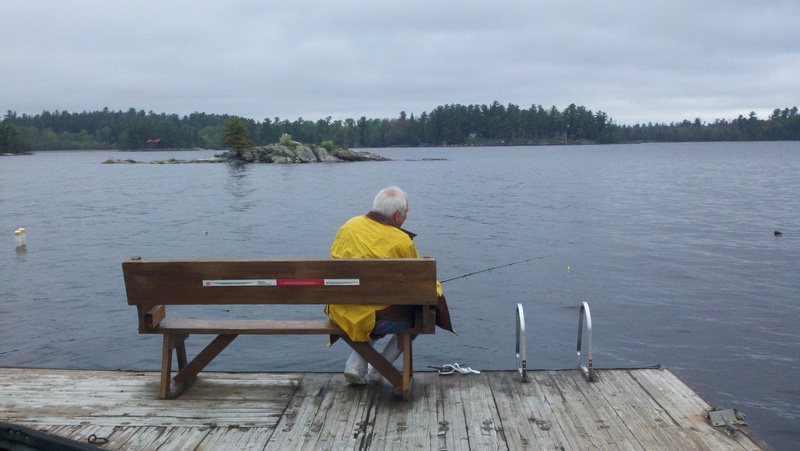 I found him sitting at the end of the pier (like he was in an earlier picture) still fishing! As I got closer I could see he had hooked a fish and it was a Northern. The fish up here don’t bite like southern fish do. The bobber (that’s what they call the cork) just goes under a bit and you know you’ve got a fish, unlike the big jerk you feel when a nice trout is on the line. He reeled the Northern in and we were both so proud. I’d say he was about 16 inches long with lots of speckles on him. Since all we had to do was walk from the end of the pier to the cleaning room I knew the fish wasn’t dead yet. I’ve seen the other workers knock the fish on the head to kill him but never my own hubby, but kill him he did and in fine fashion! 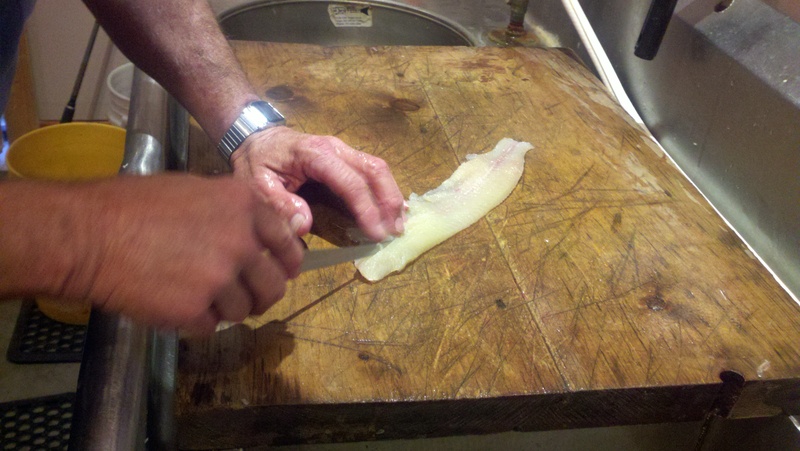 Roy started in on filleting him like the seasoned professional he’s become. Looked like a good bit of meat on the fish and then he told me “now I’ve got to make the pants”. Okay well that’s an odd northern saying so curious as I am I watched as he removed what they call “the Y bone”. You can hear the scary music playing in the back ground when they say that like some people say “mother in law” with that dread and inevitable torture mixed in! It’s a fairly long row of tiny bones that have to be removed. This little part of the whole cleaning process takes as long as everything else and it leaves you with what looks like a long pair of pants, hence “making the pants”. I so understand now. This was a learning experience for me as I watched my hubby do his job (only this time on the fish he caught), then package fishy up to take home. 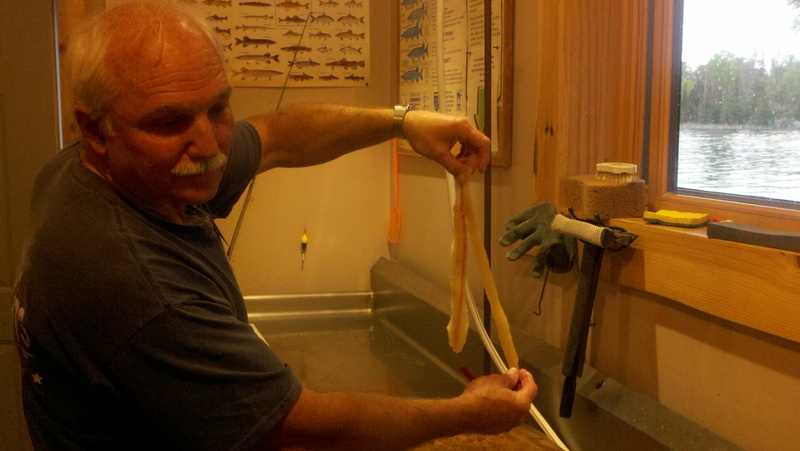 I’m posting a series of pictures I took this evening from when Roy caught the fish through the part where he makes “the pants”! The pics are at the end of this post. The resort is a licensed packaging place so there are lots of rules and regulations you have to follow to clean and package the fish. I think our guys doing this is very cool and the guests sure like this free service. I hope to never be included in the cleaning part, but the packaging and delivering I’m up to. I’ve been told that many times the wife gets called in to help her spouse when the fish cleaning piles up. We’ll see how I do on that one! The pictures below are in reverse order because I couldn’t figure out how to get them rearranged so please start at the bottom and follow the story up to the top! We’ve finally eliminated all expenses house related from our budget. All except the homeowners insurance but that’s kind of covered by their rent, so I guess that’s not on our dime any longer also!!! The new tenants have the electricity and water in their names now and we’ve taken it out of ours. Definitely one of the nice benefits of living in the RV is no more utility bills. Our food expense hasn’t gone down any even though we rarely eat out. I’m enjoying cooking more now that there is more time to do it. I’m baking my first cake in our convection oven right now. Roy doesn’t come home until 8 tonight so I want to surprise him with something special! 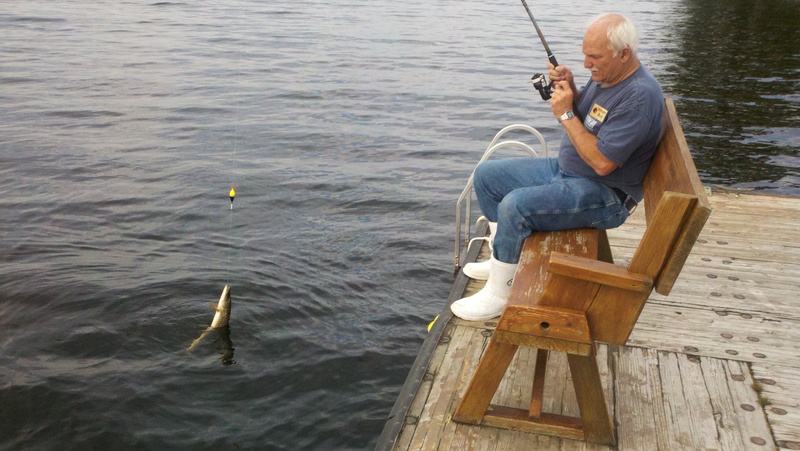 I snuck up on Roy to catch him in the act of working, and I find him fishing!!! It’s okay for him to do that if there are no guests that need him! Roy caught his first Northern Pike today, cleaned him and it’s in the frig! They have limits on the amounts and size fish you can keep here. If they are between 17-28″ they have to go back. Roy’s caught more than just that one but I believe that’s the only keeper he caught. We’re working opposite schedules this week and it’s kind of lonely around here without him in the evenings. Plus I leave at 8 am with him still asleep. At least it’s only this week that our schedules are off. Starting next week we’ll both go in at 1 pm I work till 7 and Roy works till 9. I make up some of the time on Saturday when I work longer than he does. 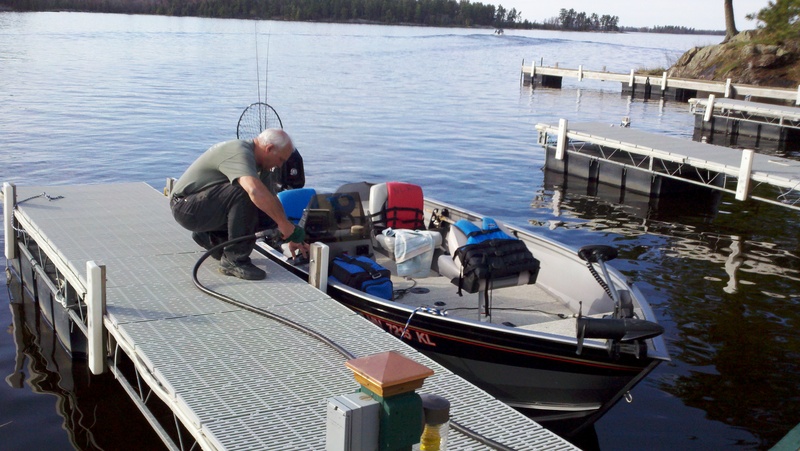 Roy in the act of working gassing up one of the resort’s boats. Today I got some practice processing credit card payments and learning how to balance out the cash register. I also got to enter charges for bait, gasoline, ice and snacks. I’ve got smooth hands from filling up all the soft soap containers. 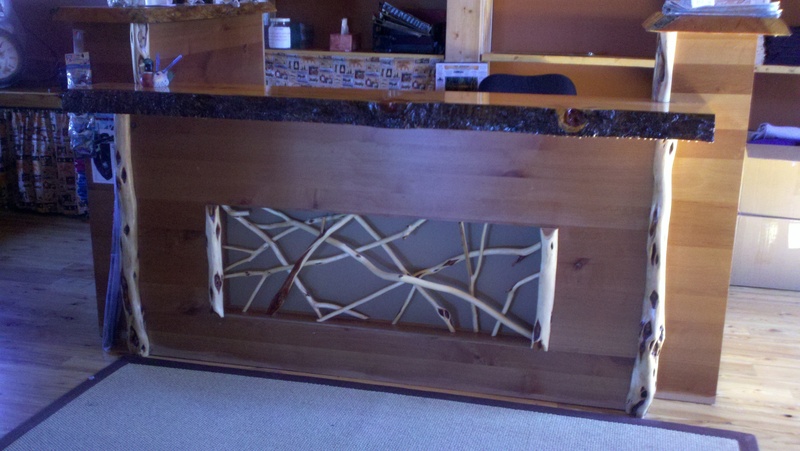 All this is cool and lots easier than working in the cabins. I also loaded up some storage bins with all the linens floor mats and kitchen towels we’ll need on Saturday when the cabin occupants leave. I’m getting pretty good at putting together the linen package of a fitted sheet, flat sheet and pillow cases and putting a little sticker with either a T, F, Q or K on it so we know quickly what size sheets they are when we’re cleaning the cabin. I will be much more appreciative of a clean hotel or other room when we are visiting somewhere in the future. We have some neat processes here that help things work smoothly. All the cleaning processes and we don’t run any motorized vehicles during the week, only on Saturdays when the guests have checked out. I can only imagine what processes they use at Disneyworld to have it running like it does! Ya’ll have a wonderful Thursday evening. Did you know people up here do not say ya’ll? I have some serious language correction to do with these folks. At least our neighbors are from Florida and understand our way of talking. Roy got us a water filter so gone is the hard water and we should be lathering up again! Also, there are layers of granite underneath the ground up here, not swampland like Louisiana!!! They really wouldn’t understand if we explained how we had to drive pilings under our houses in New Orleans and Metairie to shore them up! Later! Ya’ll come back now ya’ hear! 05.27.13 One month on the road and our days off! One month ago tomorrow, May 29th we pulled out of our driveway and headed out towards this new lifestyle of RV living full time. We visited several states on our way up north and have been settling down in Minnesota for the last almost 3 weeks. The bare trees up here have many leaves and flowers blooming now. 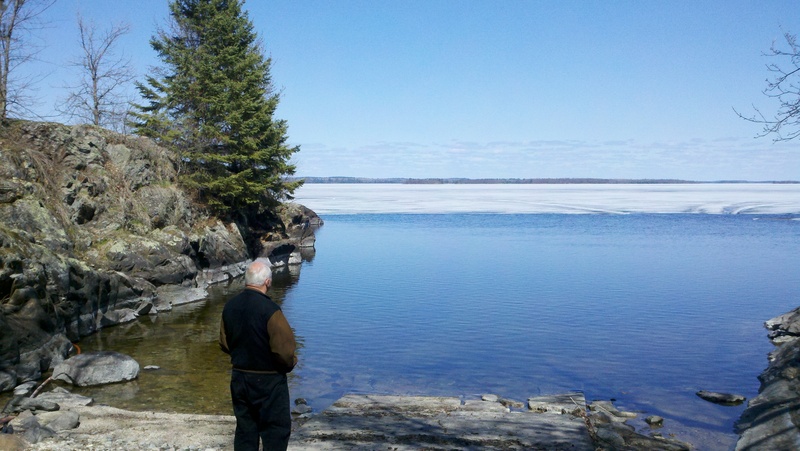 The beautiful lake ice has melted and fisherman are starting to venture out to do their thing! The guests are starting to show up at the resort a few at a time. In a week or so it will be full all the time. Our work has changed from totally getting everything opened up from being closed down for the winter, to meeting and greeting the guests and making their experience here a special one. It’s also a bitter sweet experience because as nice as this is and as much as we’re learning, we’re equally missing our family and friends back home. Our days off work start on a Sunday which we requested so that we could go to church. We went into International Falls to First Baptist Church this Sunday. It was a very traditional, conservative Baptist church and I loved it. They sang wonderful hymns and had an organ and a piano. The Pastors sermon was about Gideon from the book of Judges and I was very blessed by his message. The drive however was very long so we’re praying about which of the two church’s we’ve visited we’ll regularly attend. After church we went shopping since we were in town. I bought two hanging plants some yard decorations and a blue metal thing to hang a plant on. We can take everything with us wherever we go so we’ll have instant pretty garden. We also bought food at the Country Market for the week and to host a dinner for our co-work campers on Tuesday evening. On our way back from town we turned onto the road that brings you here which we’ve done several times before. 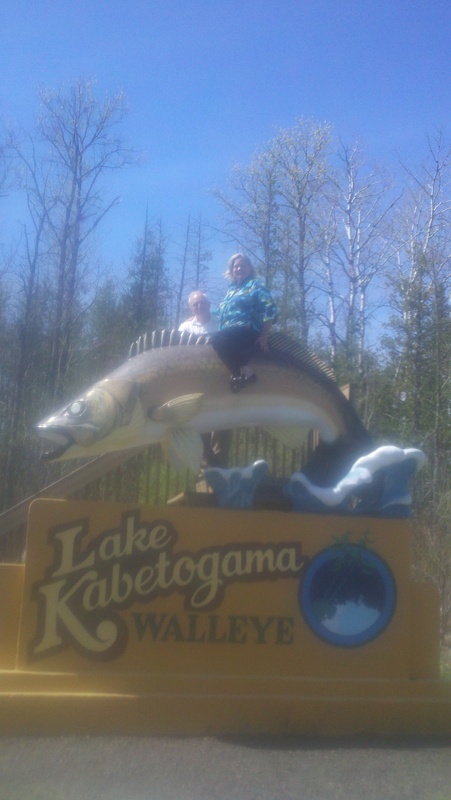 This time I noticed a big sign that says Lake Kabetogama with a giant Walleye fish on top of it. We passed it by, Roy stopped and said “I think you can sit on top of that fish” and backed up to it. Well don’t you know you can, and I did. You walk up a bunch of steps and there is this giant fish positioned to make it very difficult to get on. Maybe not for a young person but for me it was, yet I did! Another car pulled up and some ladies got out and one offered to take a picture of Roy and I up there. I’m not sure that if they weren’t there I would have worked so hard to get up there and getting off, well that was another story. Roy kept saying I can’t catch you honey, be careful!. Well, you let two old coots loose and we’ll get into all sorts of things. It was fun once I got up there and before I got down! A little closer to the resort we stopped at a neat gift shop which we’d seen before but never passed by when it was open. 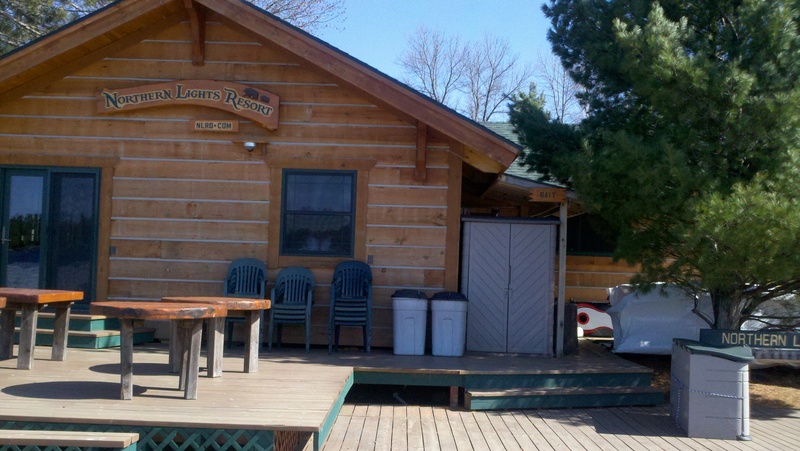 It’s a big log cabin with several rooms inside and a winding stairwell up to a show room on the second floor. Kind of reminded me of Bayou Booksellers in downtown Hammond but with a more woodsy feel. We bought a few things and saw several things we’d like to get in the future. Found a precious pink dress for Madisyn with Lake Kabetogama embroidered on it. Paw Paw picked out a matching bow to the complete the set. We’re hopeful she and Chip can fly up here during the summer to visit and this is one shop she’ll love to browse through! 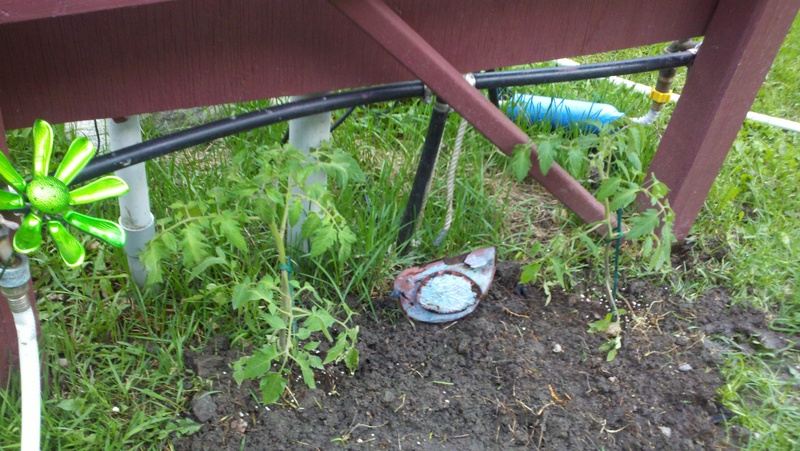 These are the tomato plants that Roy got as a going away present at Southeastern. Madisyn and I planted the seeds and we’ve been tending them till now they were ready to be planted in the ground. On Monday, our second day off, we slept late (I did, Roy went fishing early) and we planted our tomato plants that are now big enough to plant, decorated the yard with the things we purchased, prepared the food for community dinner tomorrow night and grilled hamburgers on the maiden voyage of our gas grill this evening! They were delicious and we enjoyed eating outside under the awning in the cool evening air. Our gas grill is a Weber Q 200 which we selected because of good reviews from other RV owners and how the stand and grill fold down into a small unit that can be stored under Dora really well. I’ll let ya’ll know how we like it once it gets broken in good. We went through the supplies in the maintenance garage looking for ideas of what to do with the Kid’s Quest children. I found what I think will be the perfect thing to do. A Scavenger Hunt! They did one several years ago and left the instructions so I retyped them and made several changes to eliminate the kids going to people’s cabins and to match the things I have available to hide! I’ve gathered the supplies and hopefully we’re ready for next Wednesday, our first time doing it. I also found some paint, brushes, paper rolls, stamps and sheets of paper to make some art design with if it’s a rainy Wednesday. After dinner we went out to the dock and both of us fished for a while. Didn’t catch anything but we enjoyed the peacefulness of the waterfront and we enjoyed each others company! Roy’s on the phone right now with a company that makes sunscreens for Dora’s front window and he’s ordering one for us! It will be used in place of closing the curtains since you can see out of it but no one can see into the RV. I like the curtains open most of the time but it gives you no privacy and this will. 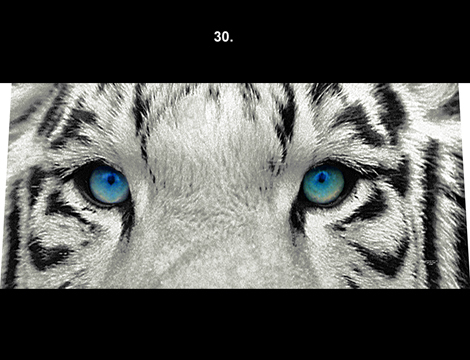 We picked out a design that is the face of a White Siberian Tiger. It’s silver and black with blue eyes and will go perfectly with Dora’s black, silver and grey sides and now Dora has blue eyes like me! If you’d like to look into getting one for your RV, the company’s website is www.heritageartltd.com. They have lots of designs and other purposes you can use these for, like hanging one from the end of a patio so it’s not just for RVers. Our managers, Rick and Debbie, have one which is where we first saw it. Theirs is a Bengal Tiger and no they are not LSU fans, they picked it because the colors match their RV. I’m finishing up preparations for our dinner tonight so I’d better stop all this and get to that! We go back to work tomorrow. Ya’ll come back now ya’ year! 05.24.13 Second week of getting the resort ready to kick into full gear! This week of work was very different from last week. We’re no longer all working together, but on our own shifts. Roy and I work almost the same schedule which is mostly afternoon/evenings which means WE GET TO SLEEP LATE!!!!!!! This is the fourth week for the other work campers and our second week. There’s a lot to learn before the resort kicks into full gear. 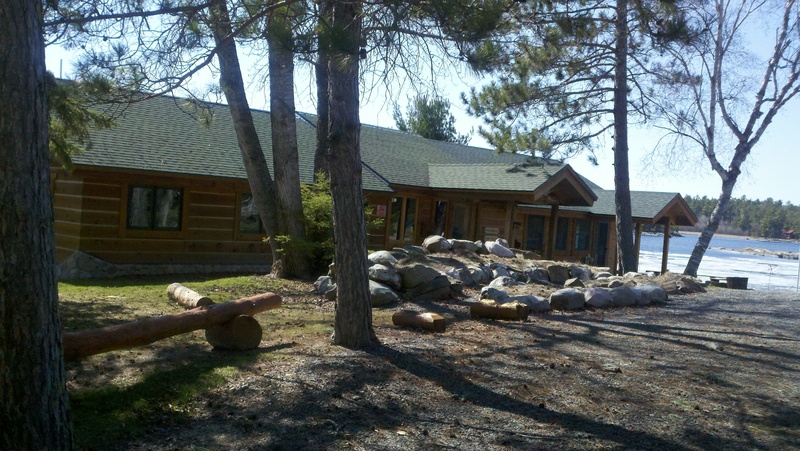 Guests started arriving this week and five of the cabins are occupied. 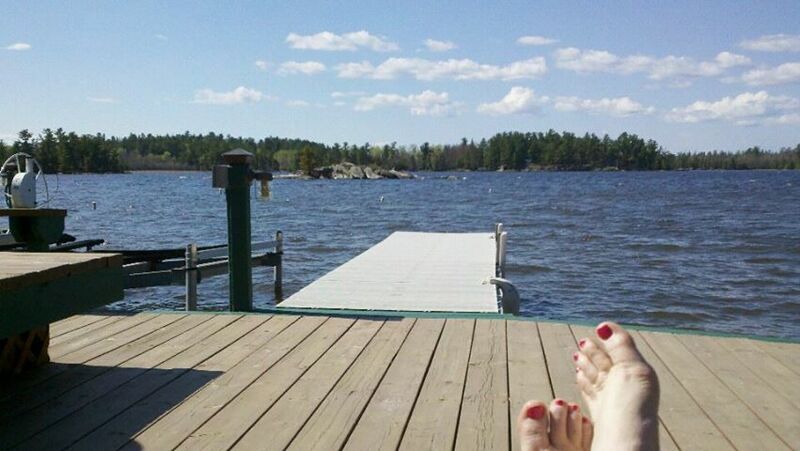 By June 1st all 12 cabins will be occupied throughout the summer until Labor Day. Entire families come here to spend the week together, families have reunions here, a church group comes in July and one man I met use to come here back in the 1950s and told us stories of how it was back then. I love that families come here year after year and it becomes a tradition to gather here and bond. There’s nothing keeping you Louisiana folks from making this your summer vacation destination, except for they are almost completely booked! This is Roy at work! I was off reclining in the lounge chair reading and he sat down waiting for someone to need him and got real comfy! This only lasted a couple of minutes so I had to take the shot when I could! Roy started working the docks helping people dock and launch their boats, clean fish, selling bait , continuing some of his handyman duties, and provided assistance getting the web site’s web cam working and some other technology things I don’t understand! When they get the web cam completely working I’ll let ya’ll know because you can go to the web page and see what’s happening on the lake and around anytime! The guys put out the biggest dock this morning so you can go way out into the water to fish if you don’t have a boat. All of the docks here are floating which are way weird after always seeing fixed docks with pilings down in the mud. Walking on them is very wicked and something that takes some getting use to! For my work I cleaned “The Loft” by myself for two days. See the two pictures above and the one below. It’s a cabin on the second floor over “Yellowstone” cabin. 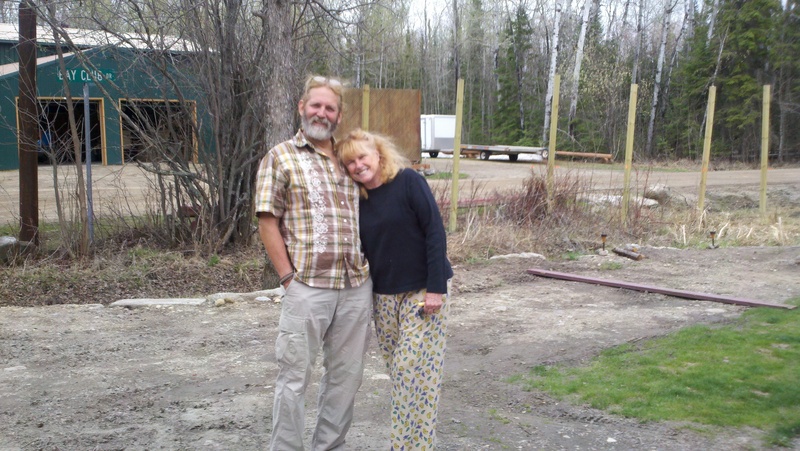 Tom and Pat, the owners, use to live there when they come to the resort, but have moved to another apartment at the resort. 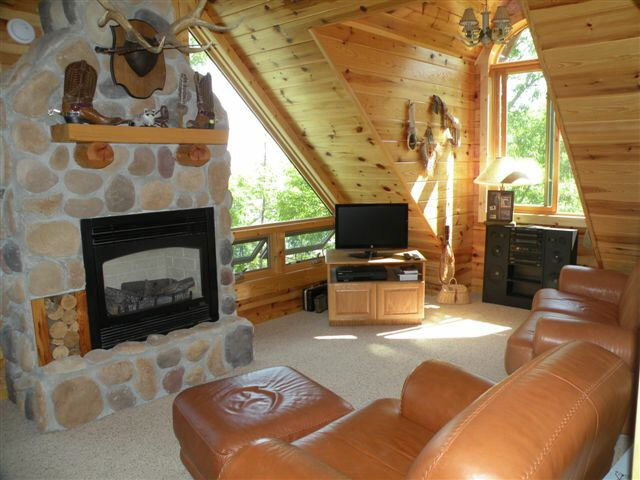 It’s a beautiful two bedroom cabin with a spectacular view of the lake. The guests are starting to go out fishing more, and from the loft you can see them skimming over the water. What a sight! Working by myself I cranked up the local Christian music station and cleaned away. One morning Annie and I were trained on using the reservation system and the cash register to charge guests for things they buy. This morning Debbie and I emptied out the van of all the cleaning supplies used during these past few weeks and got it all organized and back in the van for cleaning day tomorrow. Beth even stopped by on her day off and pitched in to help. We also put together sets of bed sheets in twin, full, queen and king by the dozens. We then put together storage bins with all the sheets, floor mats, and kitchen towels each of the five cabin that will be cleaned on Saturday will need. I finished off my work day by planting some flowers in containers on the docks. This was after my short work day Wednesday enjoying the view and reading a good book! Tomorrow, Saturday, is the “big day” of the week. Outgoing guests leave at 9 and incoming guests arrive at 4. This week we only have 5 cabins to clean on Saturday but each week after that we will have 12. 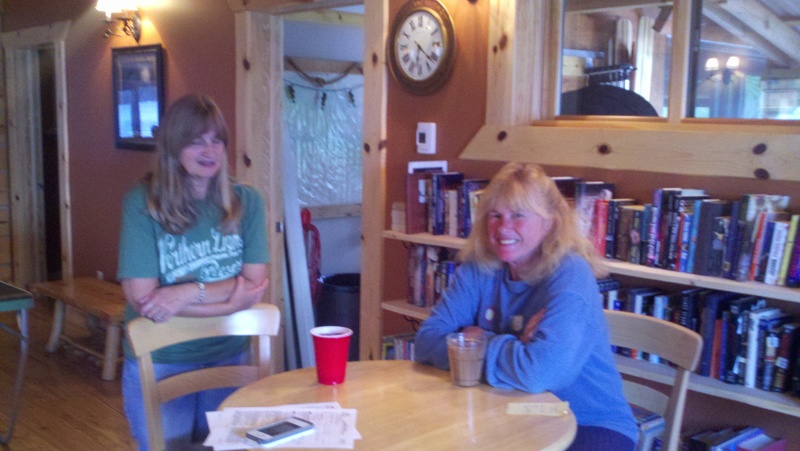 A couple of girls from town were hired to help us with the massive undertaking. Beth is making an egg casserole, some cappuccino muffins and strawberries for all of us for breakfast tomorrow to get us fully nourished before we start working. I don’t know yet what my assigned portion of each cabin will be. It sounds like it’s a very organized undertaking because all 12 cabins are cleaned between 8 and 2 or 3. Then we have a “Meet and Greet” BBQ for the incoming guests which I work from 5-7:30. Roy has Saturday evening off so he can take his nap while I work! 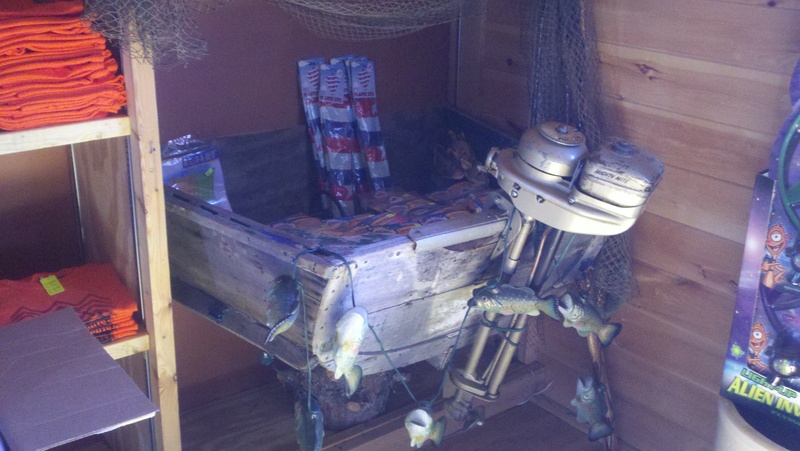 I have more to share, but it’s time to go throw a line in the water and see if we can catch us some fish! 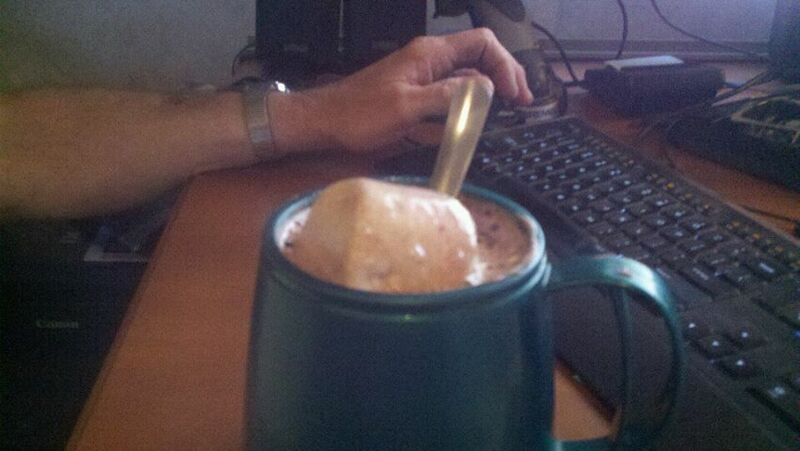 I’ll leave you today with a picture of some yummy hot chocolate with one of our giant marshmallows in it! This is one of the giant marshmallows we roast around the campfire! 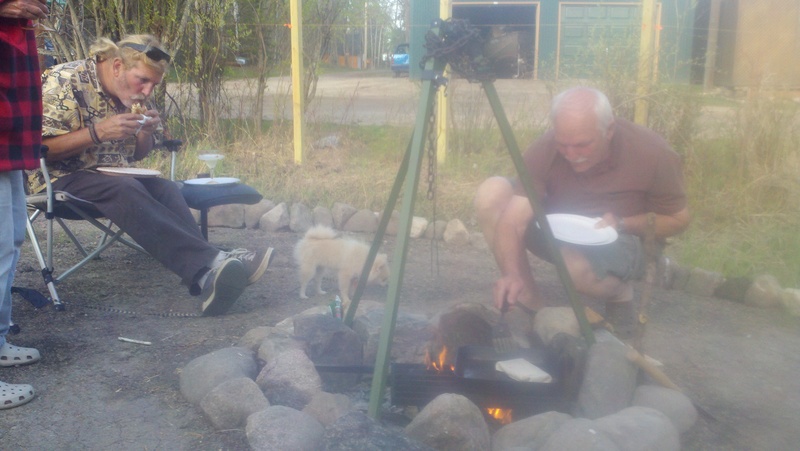 05.20.13 House is rented, our work camping family, getting settled in our homesite! We’ve rented our house!!!!!!!!!!! After nothing for six months we got a new agent and she had three people wanting to see it last week! The first wanted it and will be moving in this coming Friday. What a relief and a blessing! Chip and Madisyn got the last of their things out of the garage last weekend and it’s ready for the new family that will move in. I hope they will love living there like we did. 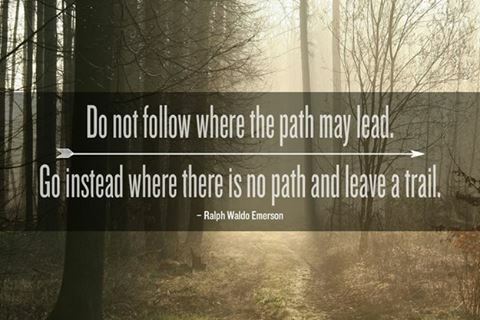 Anyone wanting an energetic, go getter for an agent should contact Jamie Johnson at Keller Williams! The pictures below are some we took last week around the resort. A view from the back of Moose cabin, our new fire pit, Roy spreading grass seed around our homes, the horseshoe pit, inside of the newest cabin, Teton, and the girls hard at work in the cabins. We’ve had four days off and it’s stormed every day plus the high has been in the 40s so we haven’t done anything we planned to, however we got a good bit of rest so we’re ready to go our next four days of work. Roy will be launching boats and working around the docks this week and I’ll be learning about working in the store so this week will be different than last week. We won’t settle into our regular schedule until the first of June. Ya’ll have a great week, it’s suppose to be sunny and in the 60s here the next week so I know WE will! View from the deck in front of Moose cabin. The huge rock goes all the way down to the lake. Imagine sitting on that swing and enjoying the view!! 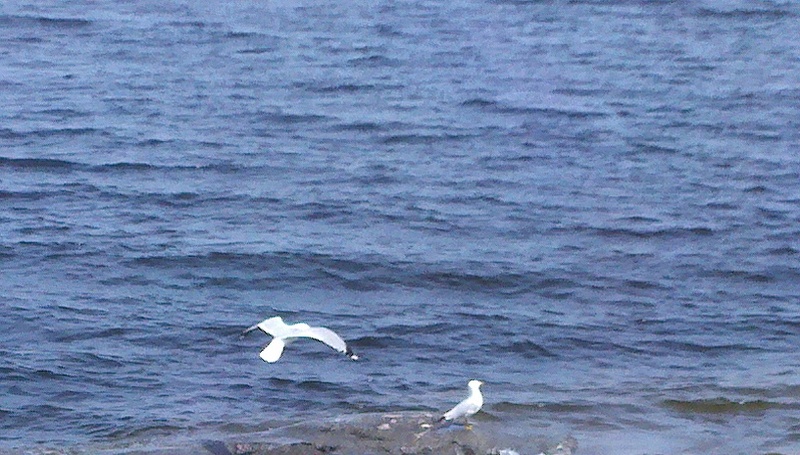 I caught this bird flying in to join the other one on the rock in front of the cabin. Russ and Annie Johnson, our next door neighbors! Sweet little Maddie is Russ and Annie’s puppy whom all of us love to play with! She played around the camp ground and got her little paws and face all black, she was quite a sight! 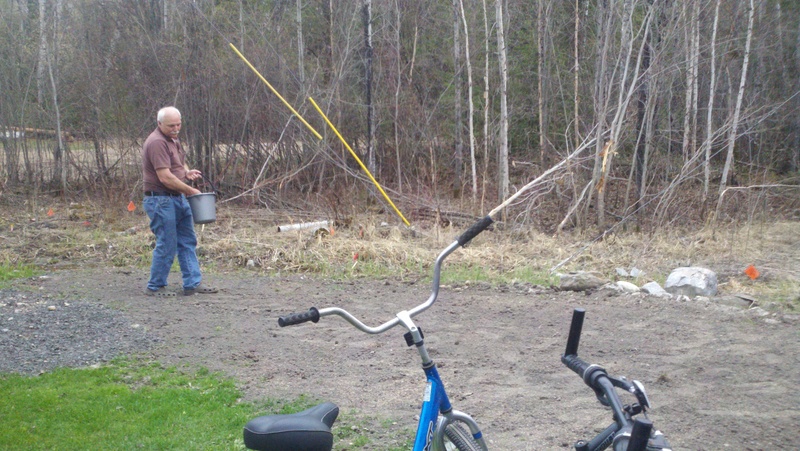 Roy is spreading grass seed behind and beside Dora! Roy worked very hard building a magnificent fire pit for us and in this picture he’s digging the dirt out. Goofy Roy decided to roast a potato over the fire and it actually came out pretty good! 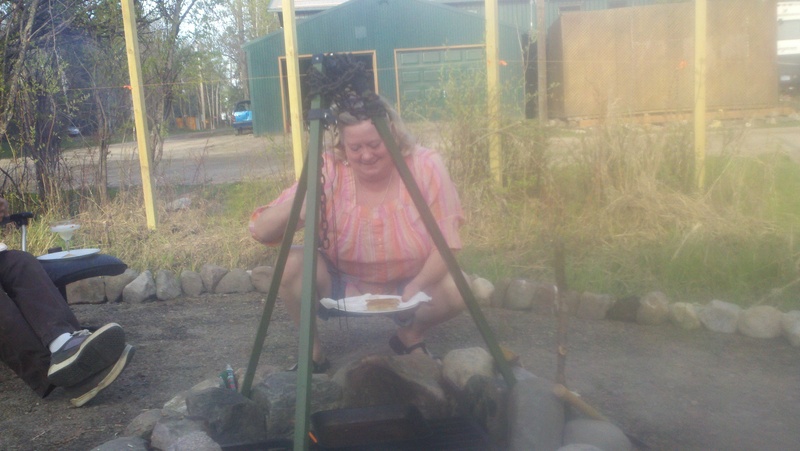 We stayed outside until 10 that night enjoying the fire. 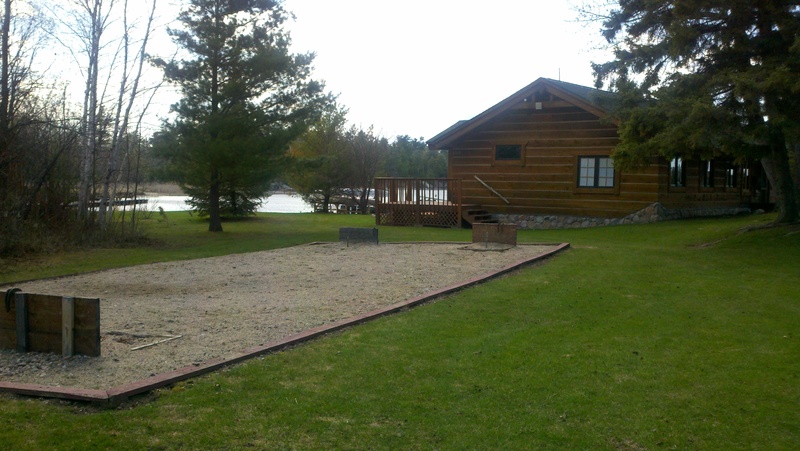 This is the horseshoe pit next to the lodge. The living room and fire place in Teton. This cabin was built last year and is gorgeous. 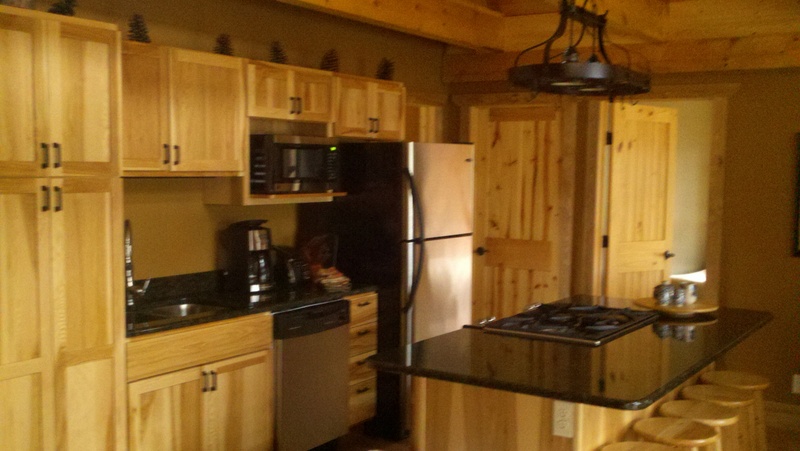 The kitchen in Teton with granite countertops. 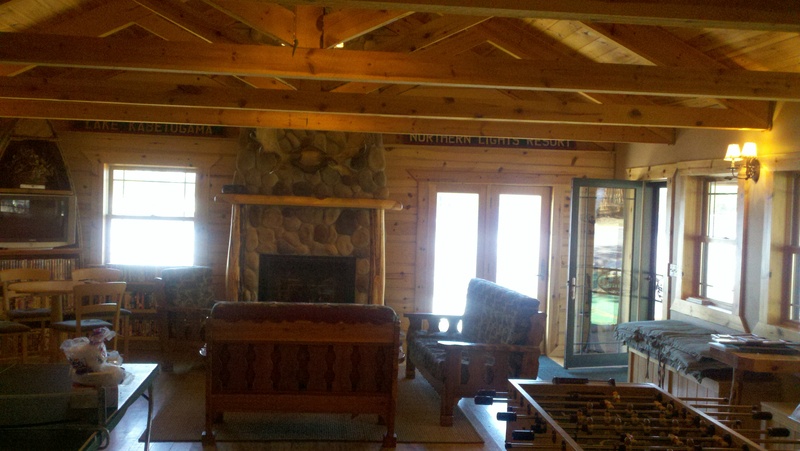 These pictures are taken after we finished cleaning the cabin. 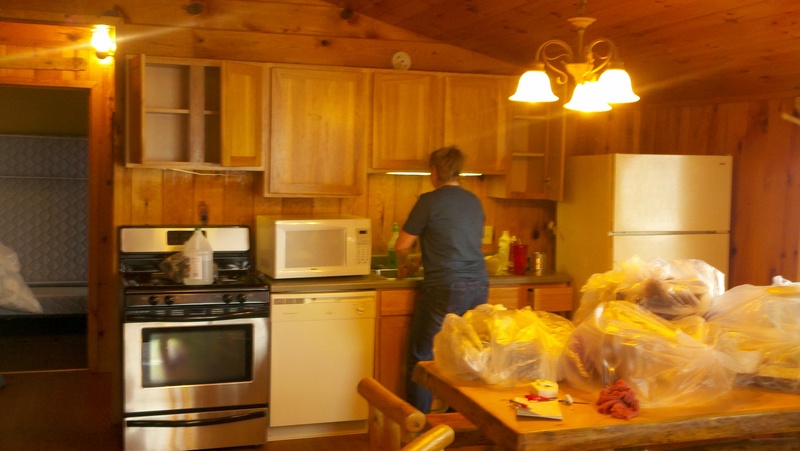 This is Moose cabin and Debbie, our manager, deep cleaning her domain, the kitchen! Beth is scrubbing a wall in one of the bedrooms in Moose. There were 12 beds in this cabin in four bedrooms. 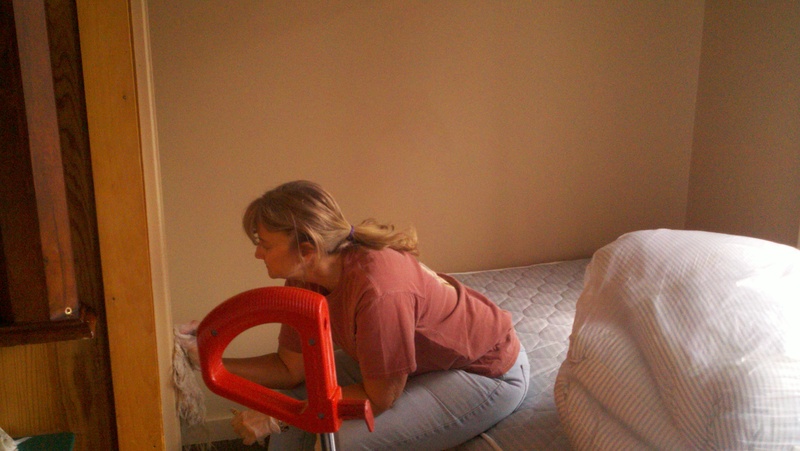 This is Annie putting her all into arranging the beds in one of the Moose cabin bedrooms! I’ve posted pictures but haven’t written much this week mostly because I’ve been too exhausted at the end of the work day to think straight much less write coherent sentences for others to understand!! Posting pictures usually is the time consuming part of the blog but it’s also a fairly mindless process, lots of clicking and waiting! Now that it’s Friday after work and there’s four days off ahead of us I will probably share with ya’ll this weekend about the glorious world God created in the North. I learned that these Minnesotans are not the rude, snooty Northerners we think of in the South. These are the friendly, kind, caring Northerners. Whew what a relief and a blessing! Our first week consisted of a lot of work! There are three couples work camping and one couple that are the managers. 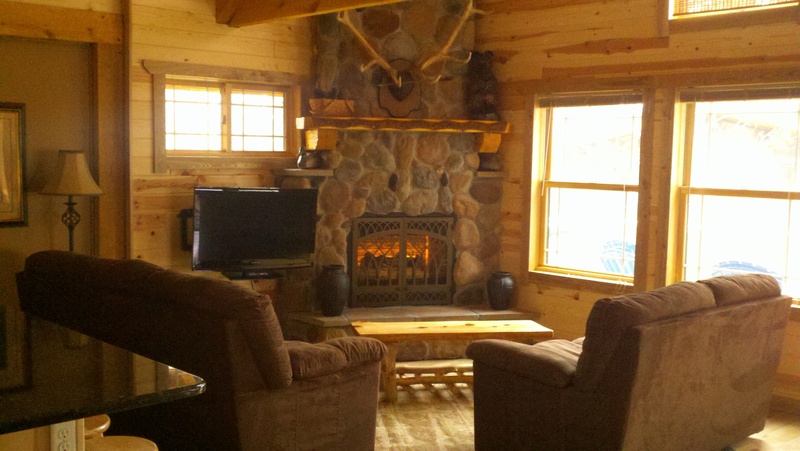 The men got the whole outdoors ready and the ladies got the cabins ready. The owner Tom was here for some of the week so we got to know him a bit. He’s a really friendly guy who works very hard around here. He’s owned it for 12-14 years and he has good reason to be proud of this place. His wife Pat is not here now but we met her when we first arrived. 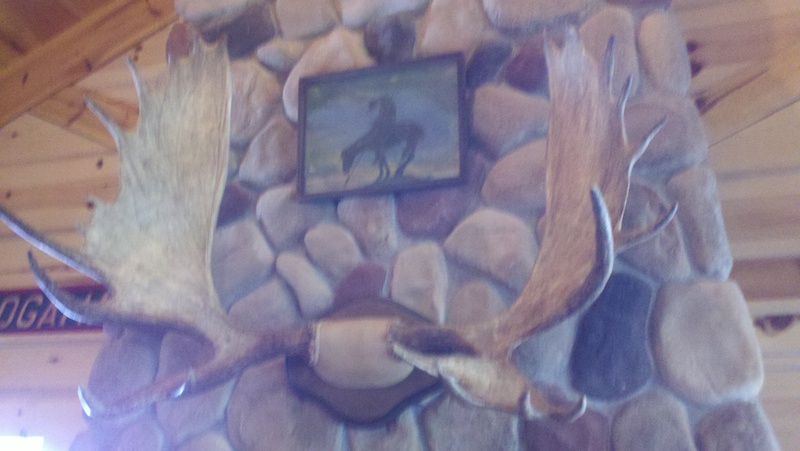 I understand she was an interior designer which really shows in all the cabin decorations. 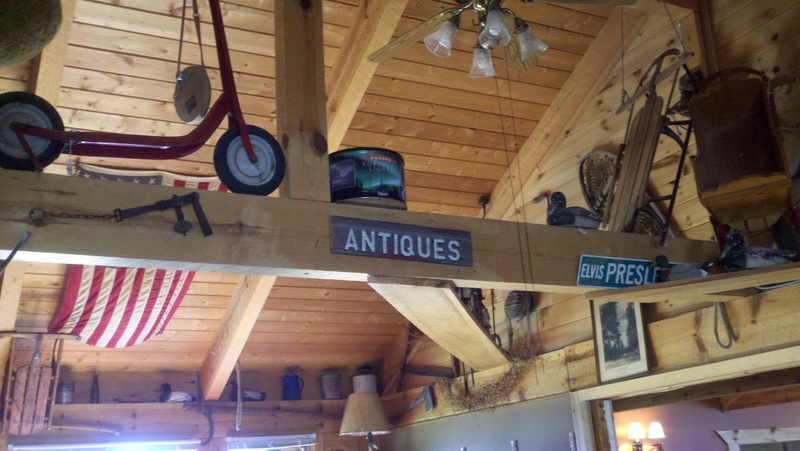 There is a model airplane about three feet long hanging from one of the cabin ceilings that I know my brother in law George would love to have! Roy quickly became a handyman since he can fix, repair or create anything. 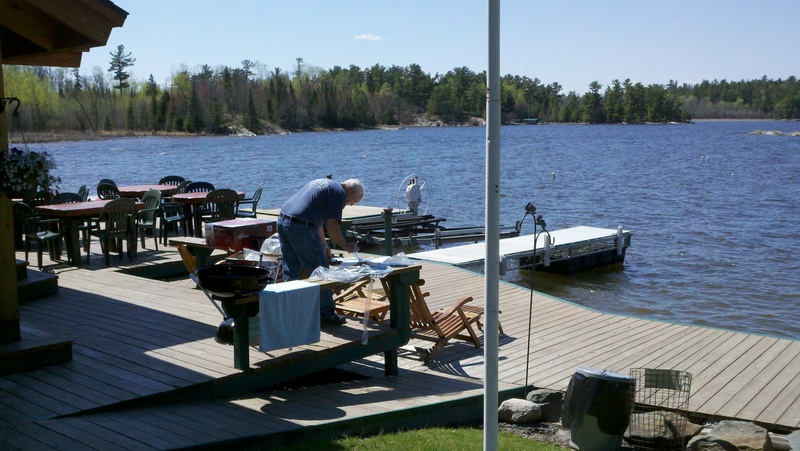 The grass was cut, leaves blown away, all the deck (each cabin has at least one big deck, mostly around a couple of sides) furniture was cleaned and arranged, the exterior of the cabins were cleaned, the docks were put out (they float), and the paddle boat and water exercise bikes were put out. I know I missed a lot of what the guys do especially since the rest of the guys were here for two weeks before we arrived. There are four wheelers, John Deere Gator wagons and the guys go whizzing around in those which is really helpful since they carry loads of things from the maintenance garage to the cabins and all around constantly. We’re planning to take one of the four wheelers down a trail nearby one evening or weekend. The ladies deep clean all the cabins top to bottom and the top can be very high in a lot of them. Every square inch is sanitized and boy do they shine when we work our way out of the doors. Most of this isn’t done each week but I’d sure feel comfortable staying in any one of the cabins knowing how thoroughly they have been attended too. There were 12 beds in the one we mostly finished today. That’s 12 mattress pads, 12 fitted and flat sheets, 12 blankets (it’s the North), 12 comforters, 15 pillows, 15 pillow protectors and 15 pillow cases. And that’s just one cabin! I cleaned 5 bathrooms myself this week. None were too bad since they are cleaned before they are closed up for the winter and the guys check the toilets for critter visitors before the girls come in! Every Saturday the guests leave and new ones arrive. That is the busiest day of the week for everyone because so much needs to be done before the new guests arrive. Once I’ve experienced a Saturday turnover and have recovered from it I’ll share the experience with ya’ll. 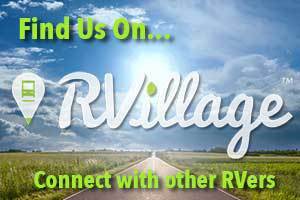 We’re all outside planting grass seed around our RVs this evening in preparation for the next few days of rain. We’ve always planted St. Augustine sod so this grass seed planting is new to us. 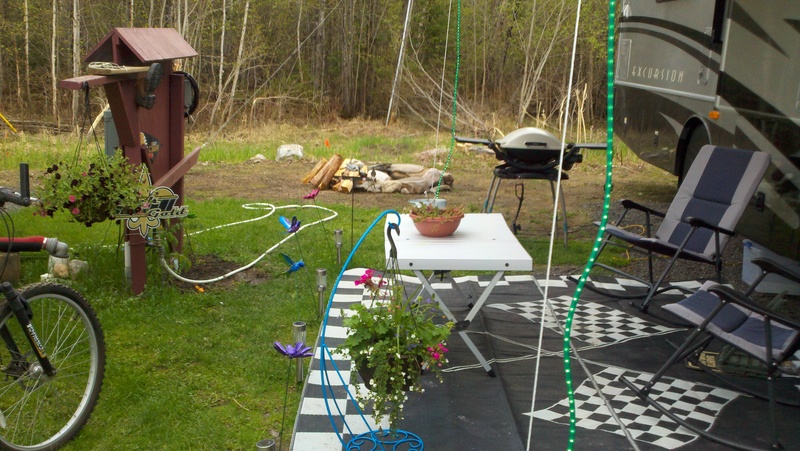 We have a place next to our RV that I plan to make into a flower garden to make our little plot a pretty yard! We put our new table outside and will probably crack out the new BBQ grill to cook steaks on soon. Do I sound like I’m loving this!!!?? Wherever Roy and I can be together we will make our home, this is truly a blessing from God. After the grass seed was spread and raked I turned around and Roy is rolling and carrying these 75 pound rocks and placing them into a circle to form our own fire pit!! 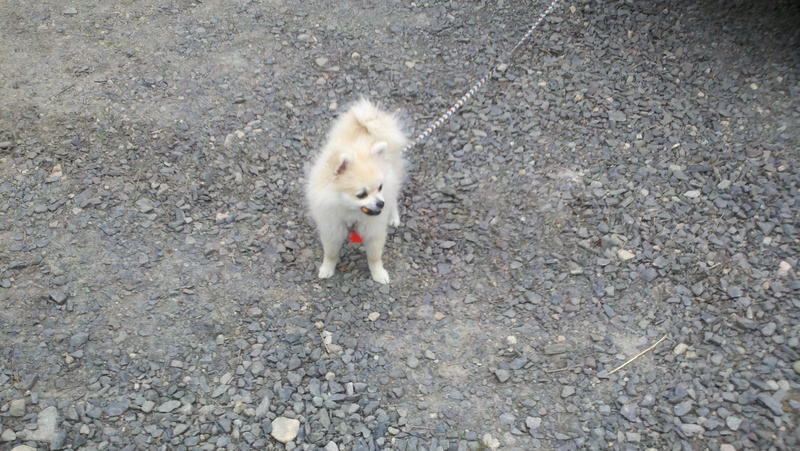 I helped gathering many small to medium rocks and before long it was finished. 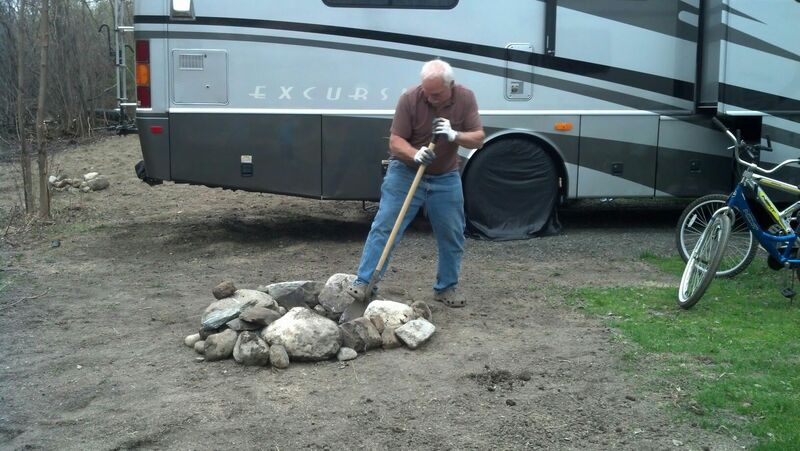 Roy then started to shovel out some of the dirt creating a neat fire pit! Then one by one most of our neighbors and the resort owner Tom came over to help us get it started. They all have experience and we’re new to this. An organization from town that employees disabled people to make these fire starter things is going to sell them at the resort and we got some of those to start our fire. They worked beautifully. The guys started splitting wood and showing us how to pile it up so the fire would breathe and burn. They were all so friendly and helpful. 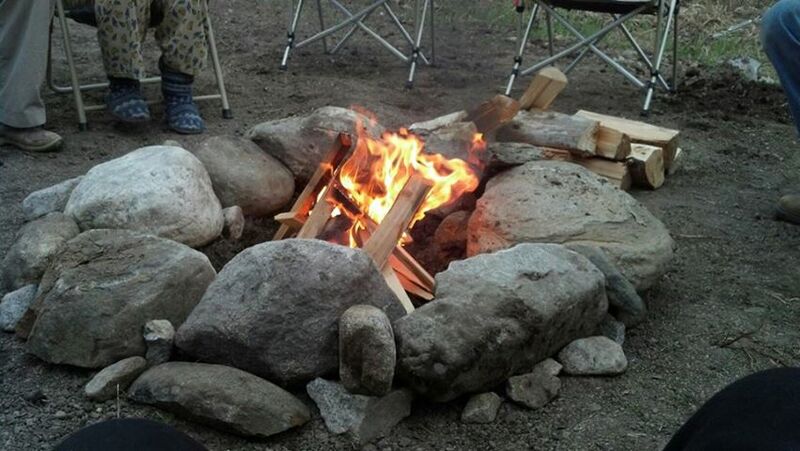 Soon we were all seated around the campfire visiting, roasting hot dogs and marshmallows. We stayed out there until after 10 pm having a blast! Tom has done a great job providing each of us with a good bit of space for our little home sites, clearing out behind them and providing us with the grass seed. 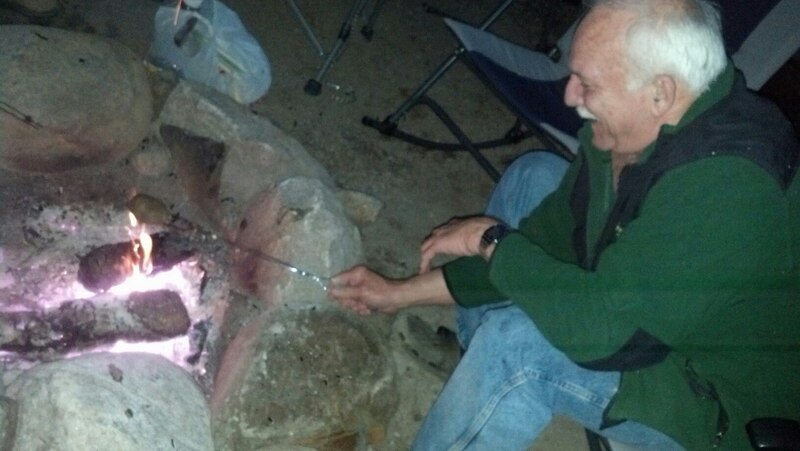 He helped us a lot with the campfire and visited with us all for a while. You can tell when talking to him that he truly loves this place and seeing his visions become reality through the years has given him much pleasure. I can’t wait for the guests to arrive, he’ll really be in his element then! I already respect him as an employer and as a man and that is a nice thing to look forward to having in our lives. I’ve written way too much so I’ll stop now. We’re enjoying our new lives tremendously but miss our son and granddaughter just as much. We got to speak to them on the phone, through only God’s doing, a little while ago and that will keep us going for a while. Thanks for reading about our journey! I have several pictures to include but time is short so I’ll do that later! Ya’ll come back now ya’ hear! – I just peeked out the back window and saw that Tom and Russ were delivering to us four nice logs for future burning. We are so blessed! 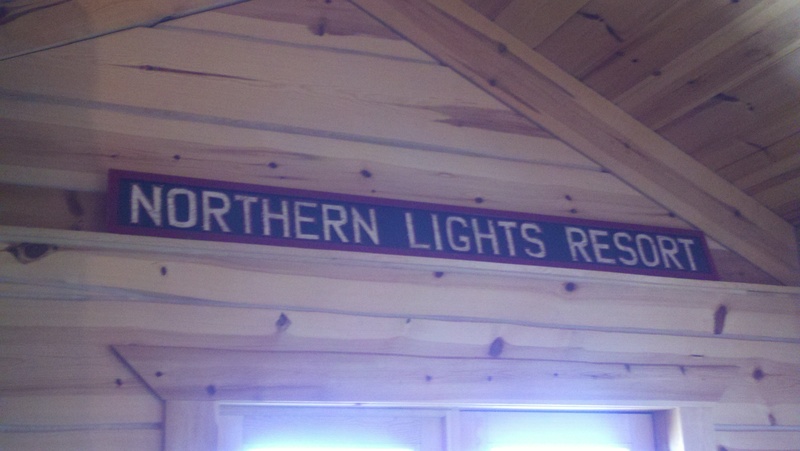 Welcome to The Lodge at Northern Lights Resort! 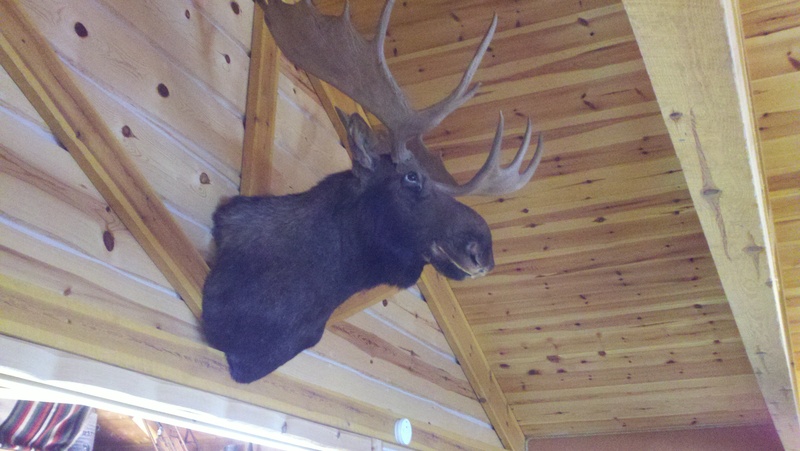 I didn’t even know these were moose antlers, they are huge – I feel fairly sad for the poor moose who has to have those on his head! 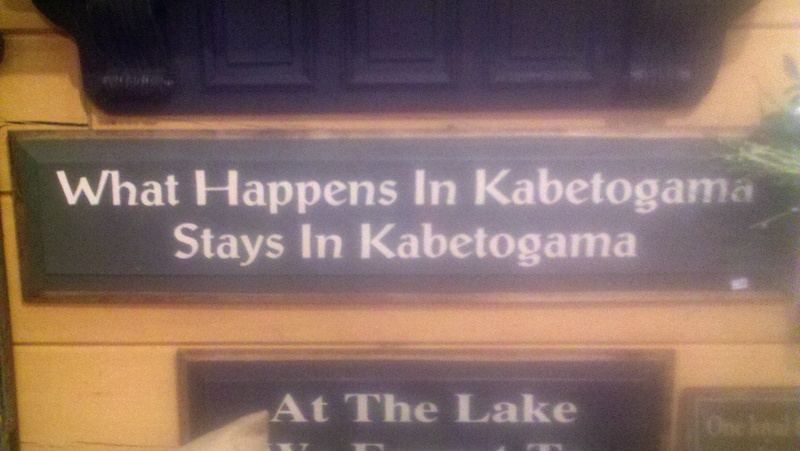 A sign inside the lodge. 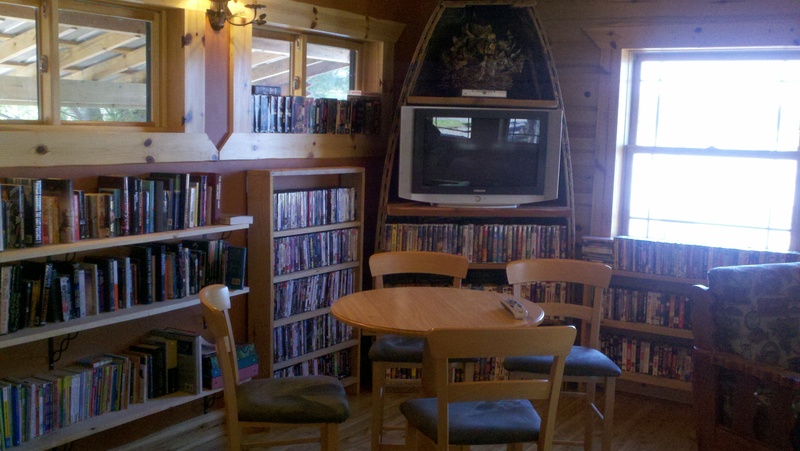 The wall of books and movies for the guests to enjoy. The TV is in the front of a boat (you’ll see the rear in a later picture). The view from there is just beautiful but the picture just shows glare! Mr. Moose with his antlers! 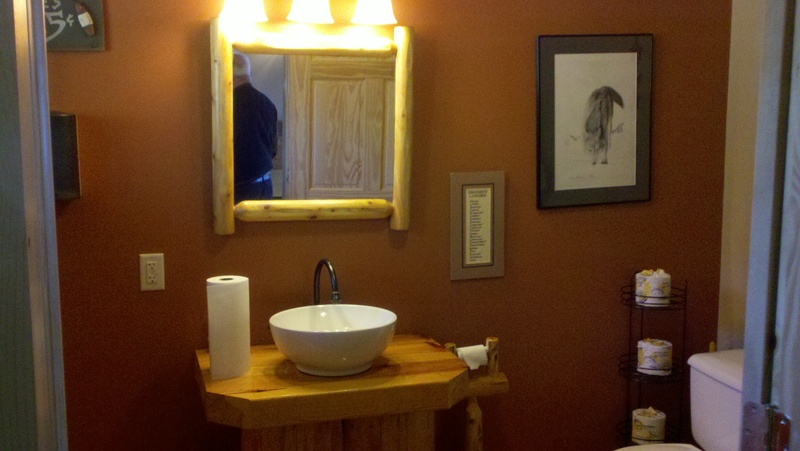 Even the bathroom in the lodge is cool! 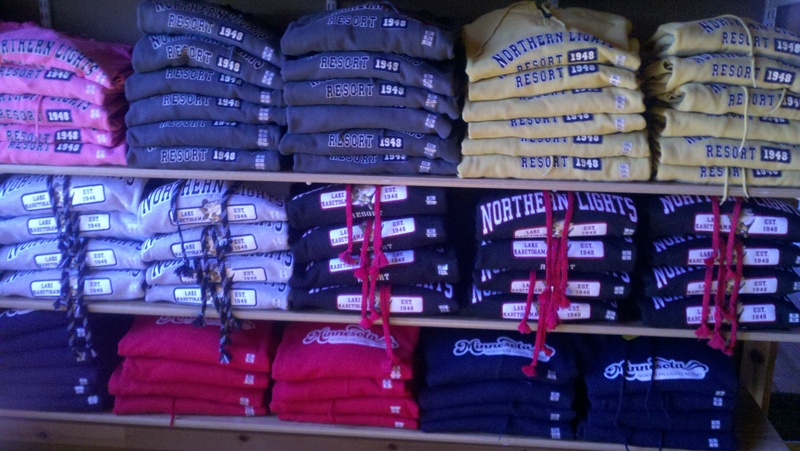 This picture does not do the store counter justice. it is beautiful. This is the rear end of the boat. There are goggles, kites and other things for sale in it. More collectibles on the store rafters! 05.13.13 What’s down the road toward the lake? 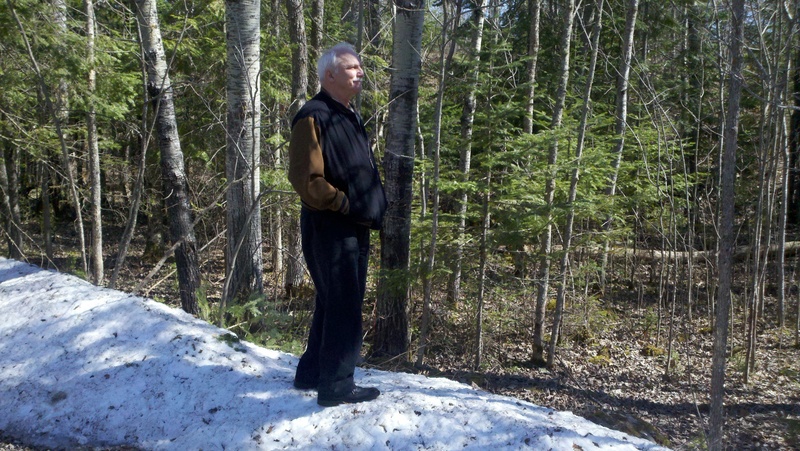 Roy looking through the woods standing on one of the last snow banks on the roads. 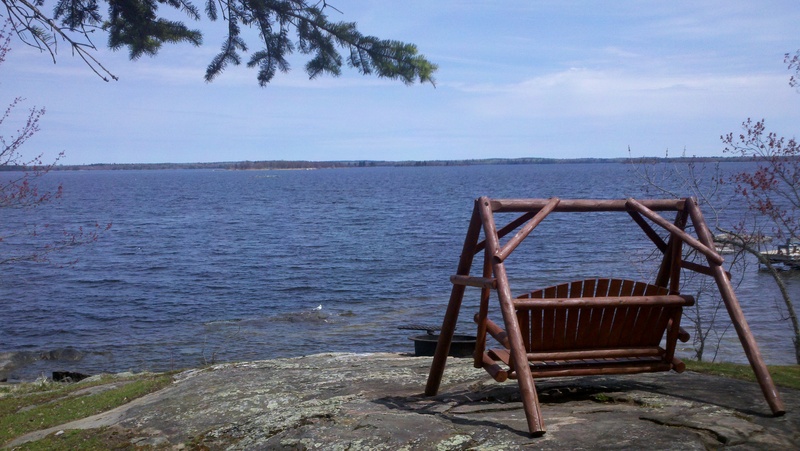 After church yesterday Roy and I took a walk off the Resort grounds toward the largest part of Lake Kabetogama. It was a beautiful sight with the ice mostly all melted, and the houses along the road were all beautiful log cabins with one having an eagle carved out of a tree along their driveway. I’ll be posting some pictures of the resort this week including one of me cleaning a Caribou Deer head. We survived our first day of work and are really loving living here! 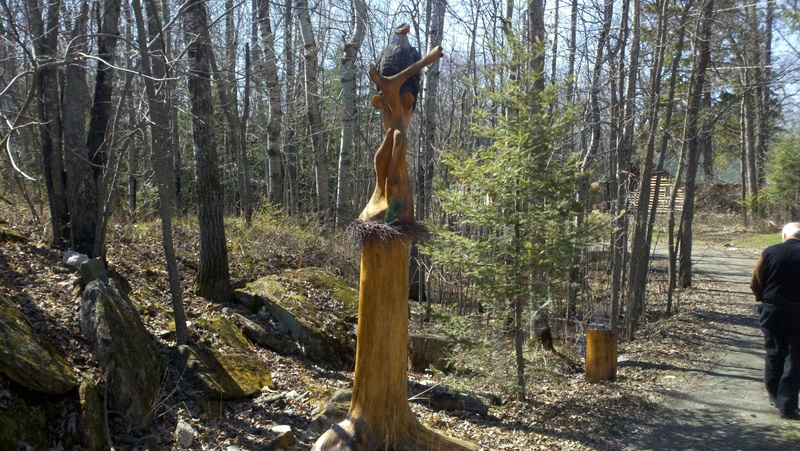 One of the neighbors down the road had an eagle carved out of a tree. The detail was remarkable. 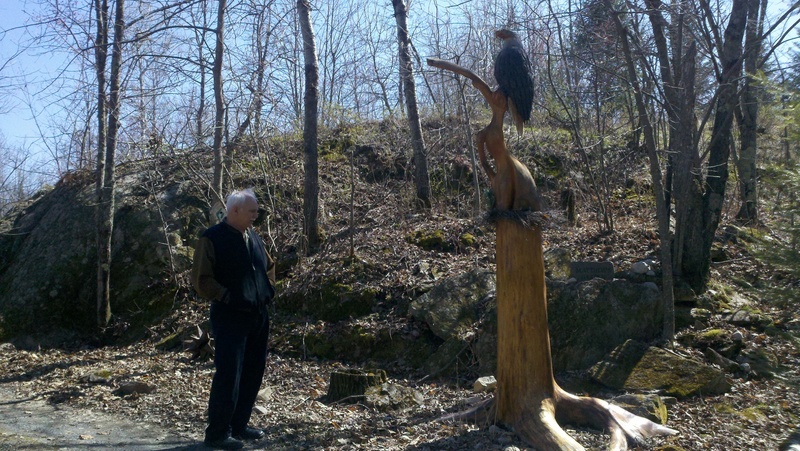 Side view of the eagle with Roy admiring it! 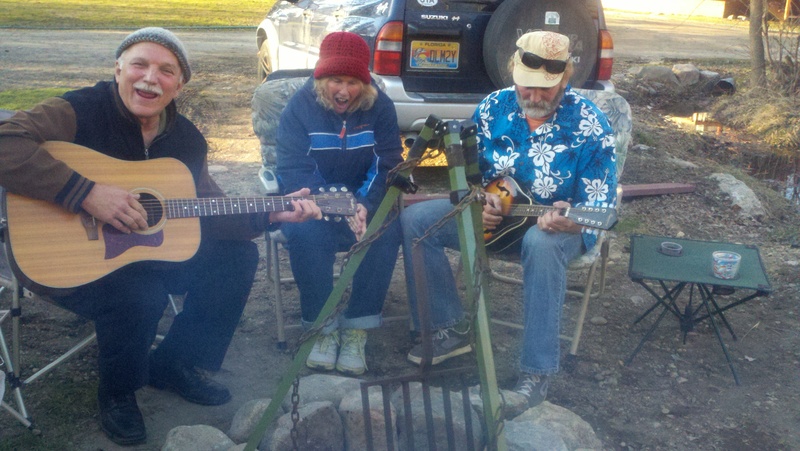 Roy, Annie and Russ playing music around the fire pit Annie and Russ made yesterday! 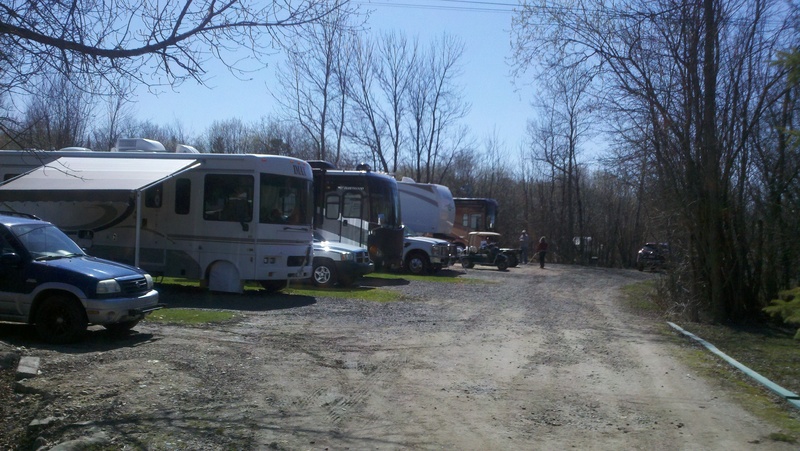 This is where we’re parked with the other workampers and their RVs, our home away from home! 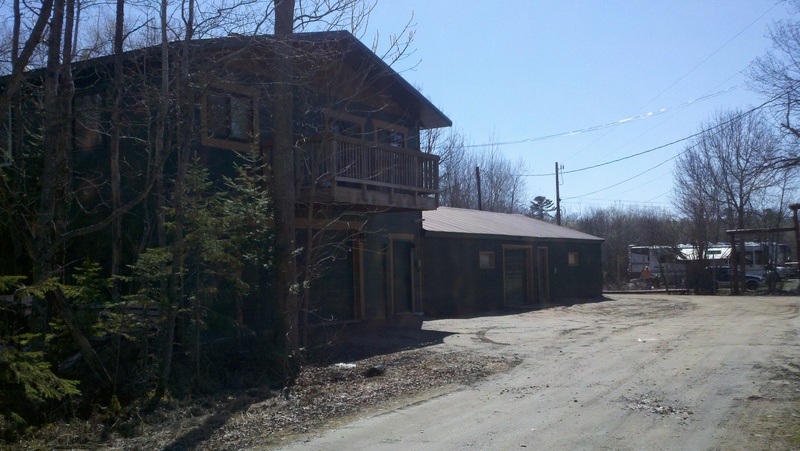 This is the maintenance garages where the boats are stored, the guys workshops and the girls cabin necessities storage. The owners have a nice apartment over the garages and the office is there. 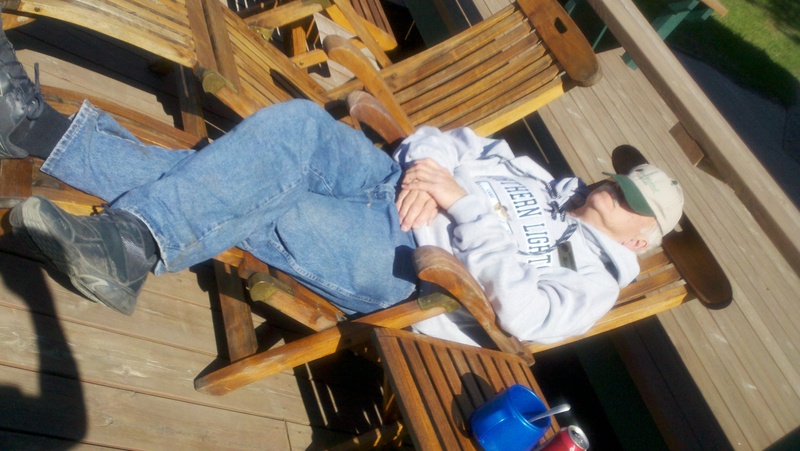 Roy looking out at the lake we hope to be fishing in soon!!!! !